Ahrens was dying from multiple gunshot and stab wounds. His last whispered words, according to Walt: “The idiot tried to come over me last night-I guess they didn’t know I was a Marine.” PFC Edward H. Ahrens, twenty-two, unmarried, from Dayton, Kentucky, died in Major Walt’s arms. The President of the United States of America takes pride in presenting the Navy Cross (Posthumously) to Private First Class Edward Henry Ahrens, United States Marine Corps Reserve, for extraordinary heroism and devotion to duty while serving with Company A, FIRST Marine Raider Battalion, during the landing assault and seizure of enemy Japanese-held Tulagi Island, British Solomon Islands, on the night of 7 – 8 August 1942. 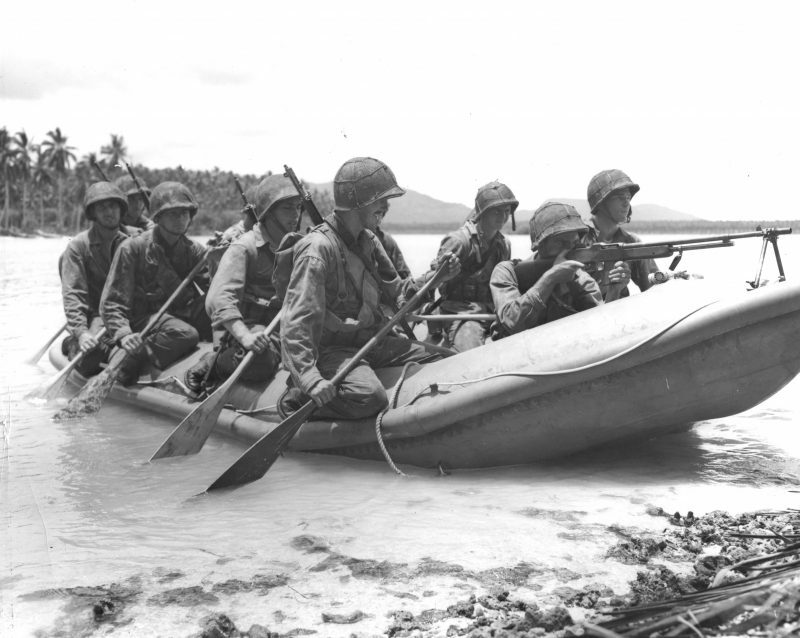 The Marine Raiders were elite units established by the United States Marine Corps during World War II to conduct amphibious light infantry warfare, particularly in landing in rubber boats and operating behind the lines. This elite unit was considered by the Marine Corps to be its first US Special Operations force. However most combat operations saw the Raiders employed as regular infantry, and combined with the resentment within the Marines that the Raiders were an “elite force within an elite force”, led to the abandonment of the experiment. Four battalions served operationally but all were disbanded in February 1944 when the Corps made the doctrinal decision that standard Marine infantry battalions would be trained to perform their missions. The personnel from the Raider battalions were then used to reform the 4th Marine Regiment, which had been lost in the Philippines early in the war.